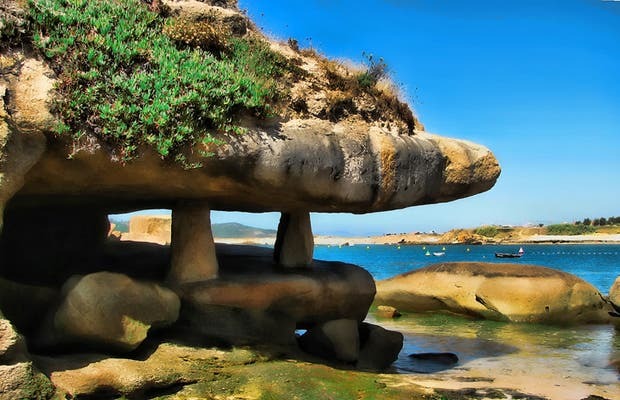 Before reaching the vast sandy expanse of La Lanzada, close tot he tourist town of Sanxenxo, you'll get to the Gorda beach, with fine white sand. The beach is in a semi-urban area, near the shrine of Nosa Señora de Lanzada, and Lapa beach. Gorda is separated from the road by small, soft dunes with sparse vegetarion. It's windy, with strong waves, and is an ideal place to enjoy the sun and sea in a beautiful natural setting. The beach is 250m long, and the sand is amazing, fine and gorgeous. Playa de Area Gorda is a beach in Noalla (Sanxenxo), close to Playa La Lanzanda and the shrine of Nuestra Señora de la Lanzada. It's a beautiful urban beach with fine white sand that's not too big but just the right size to enjoy a bit of sun in front of the clear blue water. It's kind of windy sometimes and the waves can get big. In summer, it's packed with visitors and tourists.